The ability to quickly calculate common perfect squares increases algebraic effectiveness. This is a powerful tool to either assess or help practice this skill. This PowerPoint offers three speed options: 10 seconds per slide, 15 seconds per slide, or an option to forward with a click to go at your own pace. CCSS.Math.Content.8.EE.A.2 Use square root and cube root symbols to represent solutions to equations of the form x2 = p and x3 = p, where p is a positive rational number. 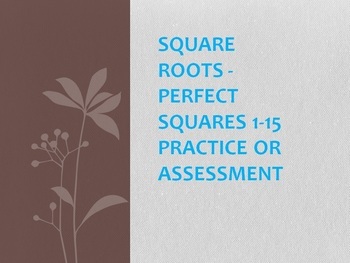 Evaluate square roots of small perfect squares and cube roots of small perfect cubes. Know that √2 is irrational.